Very few people believed in the value of satellite backhaul for providing mobile services in rural regions and in developing countries until early 2002. Since then, mobile telephony has spread and reached out to countries where the GDP level did not seem sufficient at first to allow people to acquire mobile devices and pay for subscription packages. The practicality of mobile telephony, combined with newer types of usage (SMS) and business models (flat rates), the affordability of low-cost (refurbished) handsets and the adoption of government regulations for universal coverage have led to tremendous demand for mobile services in those areas, served by satellite links. For the tenth consecutive year the satellite industry will be converging on New York City for the SATCON exhibition and conference October 12 & 13 at the Jacob Javits Convention Center. Patrick Shay has more than 20 years of management experience in the telematics industry with specific expertise in the GPS and wireless markets. As vice president, data services, Iridium Communications Inc., he provides the strategic leadership necessary to guide the companys growth in this rapidly expanding segment. Under Shays direction, the Machine-to-Machine (M2M) business continues to be the fastest growing market segment at Iridium, serving customers in industries such as transportation, maritime, aviation, oil/gas and government. He is also chair of the ProTECTS Alliance, a global industry group focused on the promotion of two-way emergency messaging and tracking solutions with more than 40 members worldwide. Prior to Iridium, Shay held vice president positions at Hughes Telematics, Sirius Satellite Radio and Rand McNally where he created and launched innovative new services in the wireless and GPS marketplace. Mr. Shay began his career with Motorola, where he led the global sales team for the companys GPS and Telematics business. Terry Magee has more than 40 years of experience in positions of leadership and management in the defense industry. At Wavestream, Terry has responsibility for business development, sales, marketing and product management. Terrys distinguished career is marked by 27 years of service in the U.S. Navy as a Naval aviator with extensive operational experience and tours on staffs and in the Pentagon. His four command tours included command of two Aviation Squadrons on the Duluth and the Kitty Hawk. Mr. Magee subsequently served as president of Orincon, overseeing significant sales and market growth until the companys acquisition by Lockheed Martin. He has since served in senior operational and strategic positions with Lockheed Martin, including the development and execution of capture plans for numerous large programs and C4ISR/IT Maritime Strategies and campaigns. Mr. Magee holds an MBA from the Naval Postgraduate School, and a BA in Biology from SUNY Brockport. He is active in several professional organizations, including AFCEA, San Diego Military Advisory Council and Tailhook, and community organizations, including Operation Home Front, United Through Reading, Palomar College Foundation and Achievement Rewards for College Students. Lars Persson has served as the President and CEO of SSC since 2007 and has been instrumental in leading SSC from a Swedish based company to a global one with presence in 12 countries. SSC is a world-leading facilitator of space programs that enables governmental agencies, companies and other commercial or research institutes to make better use of space. Through the SSC group of companies, SSC provides specialised competence in space systems, space and satellite operations, rocket and balloon systems, launch services, flight test services as well as maritime surveillance systems. More than 40 years of experience and local presence on all continents, make SSC one of the most experienced and established businesses in the field. Persson has been active in developing the global marketplace throughout his 31-year career, having served as Board of Director and/or CEO for a number of IT, telecom and space industry companies. He has been influential in the deregulation and commercialization of the European telecom carrier market, as well as the cellular market including mobile applications. In addition, he has also been working with international Venture Capital and has been an advisor to U.S. funds investing in Europe. Since World War II, vibration testing has gone hand-in-hand with aerospace and space development. The latest developments in this technology have led to synchronization with data acquisition and has benefitted satellite qualification. SES is investing heavily in its ground-based infrastructure as well as in new satellite capacity. This past few days have seen two celebratory events, one to lay the foundation stone on a major expansion of facilities at its Betzdorf headquarters (see separate box), and earlier this summer the official opening of its impressive new Astra Platform Services play-out centre near Munich, Germany. Gottlieb  On Maritime: High Stakes, Huge Risks: The Race Is On..., by Alan Gottlieb, Managing Director, Gottlieb International Group, Inc.
After years of building their business, Inmarsats third party Distribution Partners now find themselves in a price war with the giant satellite operator. They are fighting what appears to be a direct-to-end user distribution strategy. Announced in a June 30th press release, Inmarsats aggressive strategy incorporates extraordinary reductions in the price of VSAT combined with an unlimited Fleet Broadband back up package. Since Newtec opened its doors in 1985 it has consistently worked to ensure the products it researches, designs and manufactures are as reliable as possible. But even with the hardiest of kits there are still occasions when components fail and repairs are necessary. The general approach has always been to have a centralised system with all repairs carried out either in a main facility, or in Newtecs case, at one of its regional repair centers around the world. This, however, is changing as Newtec makes a new emphasis on third party partners. Certified partners will soon handle the vast majority of in- and post- warranty repair services and there are many benefits for the satellite communications industry to take as a result. EGNOS  the European Geostationary Navigation Overlay System  improving the quality of GPS signals, is a genuine European success story of innovation and cooperation in space science and technology. Charles Villie, Team Leader of EGNOS at the European Commission explains exactly what EGNOS is, its implementation and the services it provides. A revolution is underway that is fundamentally altering how navigators and deck officers navigate and captains manage their vessels. The mandated use of Electronic Chart and Display Information Systems (ECDIS) moves the bridge beyond the time-honored process of paper charts and pencils to a digital era of navigation, route planning, increased safety, and improved vessel performance. 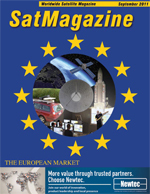 The leaders of European SatCom companies continue to comment on the market. Satellite holds its own against other broadcasting networks... Over and above the problems of cost and geographical coverage, which are very specific to each network, the comparative penetration of TV broadcast technologies is a reflection of how the TV market has developed historically within the various countries. While very uniform in North America, Western Europe comprises many nations with very diverse profiles (high penetration of the terrestrial network in southern Europe, predominance of cable in the north). As a general rule, the traditional broadcasting networks, mostly cable and terrestrial, are tending to lose market share as IPTV gains in strength. This new service, now the growth driver in the pay-TV market and particularly in Western Europe where IPTV is developing rapidly, had attracted some 13 percent of subscriber homes by end-2010.